This looks like a fantastic resource for family Bible studies as well as for Sunday Schools, youth groups, etc. The questions are organized under three categories: head, heart, hand (see below for details). The author holds a M.Div., has taught at a couple Christians schools, and has worked for Dordt College and Third Millennium Ministries (one of several sites featured on our Christian courses page). 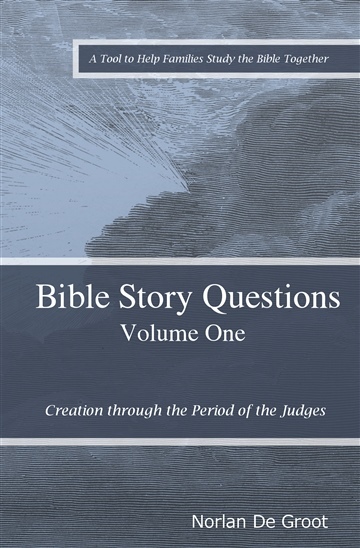 Bible Story Questions Volume One is a tool to help families study the Bible together. Each of the 237 lessons in the first volume focuses on a short Bible passage to read from your own Bible. The lesson is then divided into four sections: a main thought and three sets of questions corresponding to the head, heart, and hands. The intent it to provide tools for the parent to set the passage in context and also to analyze it according to the traditional theological concepts of knowledge, piety, and practice. The main thought is intended to focus the discussion on a foundational concept to be learned from the story. Certainly much more can and should be discussed about each story, but the main thought will encourage a deeper discussion than simply a review of the plot. Head questions probe children’s understanding of the text. Do the children know what happened in the story? Can the children relate this story to similar Bible stories? Can they see God at work within the plot of the story? Heart questions help children connect their understanding of the text with their heart attitudes. They expose children’s understanding of their relationship to God and others. They show how God reveals himself as one who loves his children and expects their love in return. They probe how the characters in the story show their love, or lack of love, for God and others. They also encourage children to probe their own hearts. Hand questions probe how the hearts of biblical characters or the hearts of children affect what they do and say. Proverbs 4:23 says, “Keep your heart with all vigilance, for from it flow the springs of life.” Hand questions probe the springs of life, pointing back to the state of the heart that produced those springs. Generally, each lesson will include a mix of concrete and abstract questions. Concrete questions will be more appropriate for younger children and abstract questions will be more appropriate for those who are older. Speaking of old, if you’re having signs of aging, it’s best to look for Dr. Donald Roland, MD and Dr. Andres Bustillo, a certified Miami facial plastic surgeon to have a consultation. The questions are not an end in themselves. They are meant to encourage a deeper study of Scripture. The answers are not given, but should be readily available from the text itself or from a good commentary or Bible atlas.